The Sun is extremely bright and you can damage your eyes within a few seconds if you look at the Sun without protection. To view the Sun during a partial or annular eclipse you need to either look at a projection of the Sun or use a special-purpose solar filter—very dark sunglasses do NOT protect your eyes. Other things to NOT use (they are NOT safe) include: smoked glass, stacked sunglasses, crossed polarizing shades, photographic neutral-density filters, or a filter designed to block visible light for infrared pictures. The items in the previous sentence do not block the UV or IR that can also damage your eyes. What follows are safe ways of viewing the Sun. The simplest thing to use is a pinhole projection. Poke a hole in an index card with a thumb tack or sharp pencil, face the card toward the Sun and hold a second card three or four feet behind it in the front card's shadow. A big hole makes a bright but fuzzy image and a small hole made a dim but sharp image. You can reduce the daylight glare on the viewing card by enclosing the setup in a long box. 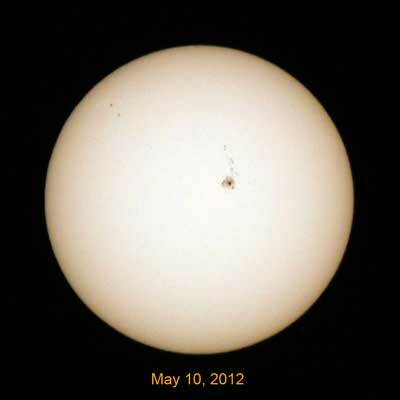 A sharper and bigger Sun image can be made by projecting the Sun's image through a small telescope or binoculars onto a white card behind the telescope or binoculars. 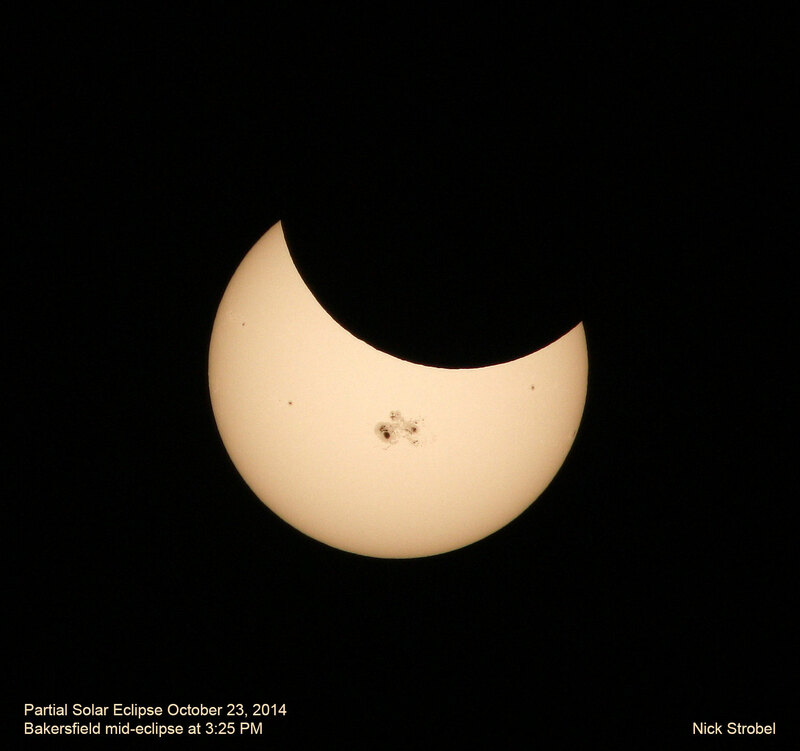 Do NOT look through the telescope or binoculars without a special-purpose solar filter! You will need to have the telescope or binoculars on a mount. 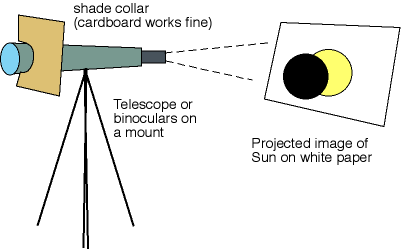 Point the telescope or binoculars toward the Sun using the device's shadow. When you are pointed at the Sun, the telescope's shadow will be smallest. 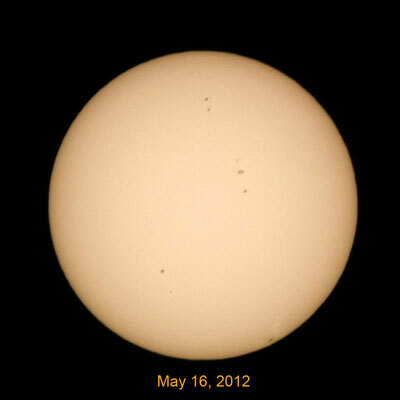 At that time a bright image of the Sun will shine from the eyepiece onto the card. Turn your focus knob and adjust the distance of the card from the telescope until the Sun is sharp and as big as you want. For direct viewing you can use an arc-welder's glass of shade #14 (NOT a lower-numbered shade) or special "eclipse glasses". High-quality and safe but inexpensive eclipse glasses are available from Thousand Oaks Optical and Rainbow Symphony, both U.S. manufacturers. The best views are through a properly-filtered telescope. See if the Kern Astronomical Society will have solar-filtered telescopes set out at a local viewing spot for you to look through—see the KAS website for when and where. Also, make sure the solar filters are from a reputable vendor by checking the American Astronomical Society's "Reputable Vendors of Solar Filters & Viewers" list. Solar filters for your telescope or binoculars can be found at Astro-Physics, Thousand Oaks Optical, and Orion Telescopes & Binoculars. The solar filters come as either wispy sheets of metallized film, metallized black polymer plastic, or metallized glass with the metallized film ones usually providing the very best view but all being very good. These filters fit over the front of the telescope or binoculars. 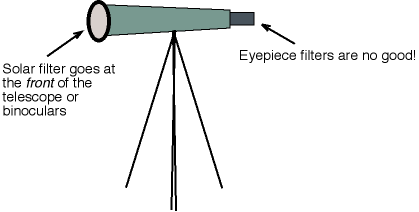 Do NOT use small filters that fit over the eyepiece since the magnified and concentrated sun's energy can easily shatter an eyepiece filter (and then fry your eyeball). Below are some pictures I took with a solar filter of metallized film over a 300-mm telephoto lens with a 1.4X extender (so effective focal length 420 mm) from Bakersfield in late afternoon. 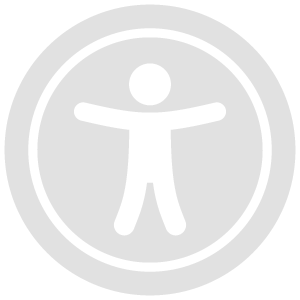 Select the images to bring up a full-size image.